Artwork Archive is an ingenious online tool for artists to manage their collections of artwork--keeping up with things like where pieces have been shown, where they are currently displayed (helpful when working with galleries), when they have been purchased and other details that need to be tracked. It can also be used to maintain contact information for clients, galleries and others on your mailing list. And one of my favorite tools is the reminder it sends me each week about what I have coming up: submission deadlines, delivery dates, shows to take down, classes to teach, materials to submit and much more. My landing page on the Artwork Archive site. In addition to the "back-end" business tools, Artwork Archive also presents my work to gallerists, collectors, art consultants and others looking for artwork. In fact, I had a museum curator reach out to me with questions via Artwork Archive just last week. 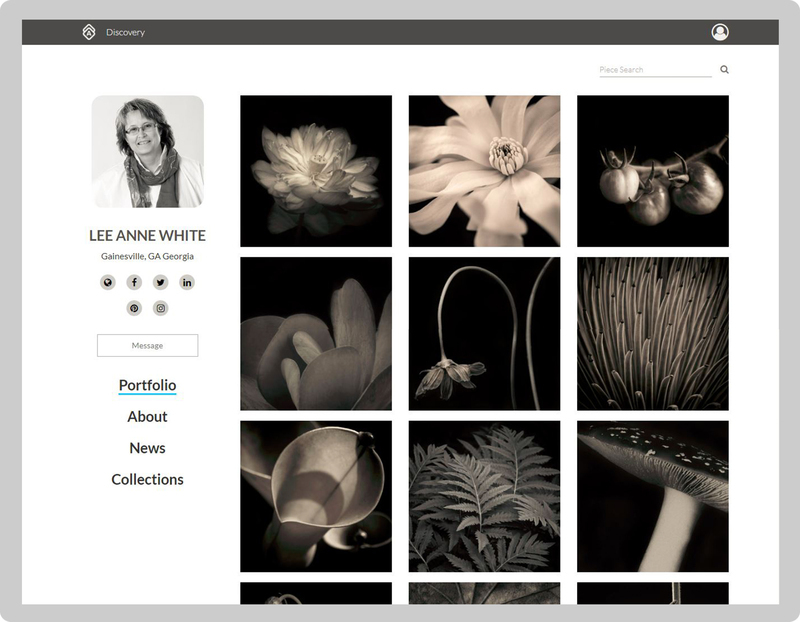 The beauty, essence and changing complexion of landscapes fascinates artist and photographer Lee Anne White. And, she carries that beauty over to her portfolio. It is completely and beautifully branded. In other words, as soon as you open her portfolio, you understand the type of work she creates. The clean grid formed by her square dimensions feels bold and modern. Another amazing feature of her portfolio? She includes just the right amount of detail when you click on each piece! Anyhow, I thought that was pretty cool and just wanted to share. If you're an artist and need to track your own artwork, check it out. And if you're looking for artwork of any kind, it is a clean, intuitive site for searching.